Great for Newark, Not Great for D.C. Exactly what kind of senator will Cory Booker make once he coasts to (a near-certain) victory this fall? On the one hand, Booker—the Newark mayor and reigning viceroy of Twitter—has a habit of lionizing the tech and finance executives who are his biggest campaign donors. Last year on “Meet the Press,” he famously criticized President Obama’s “nauseating” assault on the private-equity industry. Booker’s ease around business moguls is such that he betrayed no sheepishness when The New York Times disclosed that several had funded his personal Internet venture, potentially worth millions to him, while he was ensconced in City Hall. On the other hand, Booker does really seem to care about the poor. He spent a decade at the best universities in the world—Stanford, Oxford, Yale—before setting out on a 15-year-plus tour of duty in a hub of urban dysfunction. Surely there were better ways to monetize his fancy degrees. And while his experience fighting poverty can look self-serving—how many times must we hear about him choosing to live in the projects or subsisting on food stamps?— this would be quite an ordeal to put oneself through were it simply a ruse. Booker is in fact fluent in the wonkery of poverty, from eliminating urban “food deserts” to providing universal access to preschool. On top of which, Booker has been a pretty good mayor. Violent crime in Newark, while still a scourge, has declined on his watch, notwithstanding a brutal recession. He has hacked away at a crushing structural deficit and presided over a downtown development boomlet. None of these trends is going to lure transplants from Westchester. But, given where Newark started, it’s hard to argue that Booker hasn’t been a net plus for the city. And yet I worry that Booker’s corporate chumminess will foreshadow his Senate career much better than his urban crusading. If anything, being a senator may only draw him further into the orbit of the 1 percent. Why do I have so little faith in Booker? For starters, there’s no real contradiction between an excessive reverence for the masters of the universe and a sideline interest in the poor. The masters of the universe frequently evince such interests themselves. Most major corporations employ a handful of executives whose job it is to hand money out to the disadvantaged. The dicier the firm’s reputation, the bigger the sums tend to be. Goldman Sachs has a five-year, $100 million program designed to cultivate women entrepreneurs in low-income areas. It is by most accounts a serious initiative. Nonetheless, it’s a rounding error on Goldman’s net earnings— $7.5 billion in 2012 alone. Of course, the fact that these exercises are worth the money and then some from a marketing perspective doesn’t mean corporate honchos don’t care about the poor. Robert Rubin, who co-headed Goldman before joining the Clinton administration, was personally very committed to reducing poverty. As a trader in the 1970s, he attended meetings of a neighborhood group in Harlem to learn about inner-city problems. As treasury secretary, he defended the Earned Income Tax Credit (EITC) and the Community Reinvestment Act (CRA), which helps keep loans available in minority neighborhoods. Still, it was mostly costless for Rubin to champion these causes, noble as they were. They didn’t clash with his deregulatory efforts or make it harder to sign free-trade deals. The EITC adds little to the federal deficit in net terms; the CRA’s direct cost to the financial sector is minimal. In 2010, Booker endorsed a state constitutional amendment proposed by New Jersey Governor Chris Christie to cap annual property-tax increases at 2.5 percent, the kind of crude fiscal hand-tying that even centrists like Rubin typically reject. In fairness, New Jersey had the stiffest property taxes in the nation, and so reining them in was a bipartisan preoccupation. But the Christie plan lacked some critical fail-safes—like allowing towns to suspend the cap through a majority vote and providing state aid to prevent deep cuts in local services—that had made the approach work elsewhere. Booker’s aides insist he is a progressive at heart; it has just taken time for him to modulate his message for a national audience. “I think people grow ... in terms of the way you understand how you can fix problems,” says a staffer. This may be true: For example, Booker quickly backtracked after his Bergen Record comment on Social Security. Yet the most alarming feature of Booker’s politics isn’t his proto-Rubinism. It’s a more primitive instinct—a skepticism of government that flourishes in certain (usually right-of-center) circles of financial elites.4 Naturally, Booker doesn’t quite put it this way. Often his skepticism is merely the subtext of a riff about some heroic collaboration with a deep-pocketed donor. Kevin Griffis, Booker’s spokesperson, says that a Senator Booker would try to “think creatively about whether or not he can use his convening power ... to bring the same innovations you’ve seen work in Newark” to other parts of New Jersey, even the country. To point out just one flaw in this plan: If corporations were less keen on using loopholes to save billions in taxes, we wouldn’t need to rely on the millions they donate to charities and cities like Newark. No doubt the country’s biggest corporations will be keen to embrace a freshman senator who preserves their cushy arrangement.5 And Booker will have plenty of chances—closed-door negotiations, dead-of-night amendments—to vindicate their enthusiasm. The far bigger problem, though, is that Booker’s philosophy simply doesn’t scale, to borrow a word he has learned from the tech sector. Most mayors don’t have a fraction of the star power and connections that Booker does, something he’s happy to note. (“I don’t mean to sound immodest,” he told his local paper. 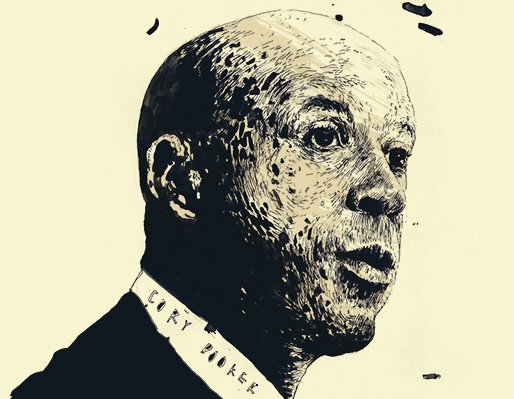 “But [the private donors] all say, if you run the schools, we will come to Newark.”) And even if there were a hundred mayors who could match Booker’s wattage, there aren’t nearly enough check-writing billionaires to make much of a dent in their to-do lists. Only the federal government and a handful of states have those kinds of resources. Outside the context of a local politician struggling to fund his agenda, Booker’s worldview—the mild suspicion of government initiative, the trivialization of paying taxes as a way to bring about change, the sanctification of corporate do-gooding—is a few ticks to the right of a Clinton-era New Democrat. Really more like enlightened Paul Ryan-ism. There are definitely worse philosophies. But it’s not exactly progressive. Booker has explicitly rejected the idea of assigning blame to bankers. He told Piers Morgan on July 13, 2011 that: “In America, we can't get caught up in the finger-pointing blame. Yes, there are problems with big banks and the packaging of these mortgages but there are also people, and I saw it in my community, jumping into homes that they couldn't afford. But again, it's not time to vilify people. It's time for us to take a deeper sense of collective responsibility.” In fairness, he did criticize congressmen who voted for financial deregulation during a Senate primary debate in August. Booker’s most prominent deviation from liberal orthodoxy is probably his longstanding support of private-school vouchers.